Or maybe try the stay-alive decoder? That is what I am planning to do next, with all my loco's. It made a dramatic difference in the porter 0-4-2. But the more I think about it, the more the battery seems like a fail-safe method. If you do go that route, please do a SBS. I have been wanting the hobby to work toward batteries for a while because it seems like it would solve a lot of problems IF they could make it practical and solve the issues with batteries. What I like about switching to On3 is that I don't have to have a huge fleet of locomotives and I can invest in the few I have, so even if the cost of switching to batteries, even if it did mean a different control system, would be worth it if it meant better operation. I would also solve all those issues with the steel rims on that shay, and actually it would make it pull better because the build up on the wheels actually give it more traction. I will post it if I do the conversion. I look forward to it. Were you thinking of a 9v battery? My thinking at this point is that the locos with tenders would be suitable candidates for conversion. I have been doing a lot of thinking and revising of my track plan. I am now more comfortable with what will and won't fit in my space in O scale and I realized that building those Manns Creek structures full size will just dominate the layout too much. Also my first plan was mostly a place to put those MC structures until I get a larger layout space...well...that may not happen as soon as I had hoped, we may be in the house we are at a lot longer than expected. I redesigned my current space to allow more switching of coal cars, I eliminated the car shops and selected a smaller company store. I also added one large mine that will load real coal. I moved the strip mine coal "tipple" on the other side of the tracks so operators can see the front of it and not have to look around it. This part of the layout is very high, about neck level on me (I am 6'-0"). there is a very steep branch that runs along the backdrop up to a small mine that will load a few cars a day. This redesigned plan now gives me three locations to spot hopper cars and a company store that has a long siding for box cars and for unloading supplies for the mine from flat cars or whatever. the switch back has changed so it can have 8 car trains run into it. The train will run locomotive first from the dump trestle (clockwise), through the tunnel, up the 4% grade along the front edge of the layout, and into the temporary switch back stub track, then it will back up the temporary switch back track and into the small yard at the mine town. There will be a track that will curve in front of the utility closet that will allow me to build a removable expansion to the mainline. If I get the layout in my room done when my kids move out (18 and 16 now) I will expand into the next room with a 36" long lift bridge. It is not the best design but it does allow the locomotives to climb the grade to the mines clockwise which will keep the shays running gear facing the operator. The nice thing is that the lift bridge will not have to be moved once an operator is in the layout area. The new expansion will be mostly to expand the running distance to the mine. The new line will be high (close to eye level) so I don't want a lot of switching at that level. The main line will enter the new section and have a passing siding, then a steep 4-5% grade to summit trestle, from there the levels for a moment then falls on a 2% grade to a mining area. there is a small mine at Summit trestle but a larger one will be at the dead end aisle, the floor can be raised in that area to make it more comfortable for switching. The plan does not really show a mine in that location but I will change it to have one. the new extension will pass back through the wall and connect with the original mine area and the old switch back could be removed, if left it would provide a nice running loop but I just won't use it for an operation session. Given how slow these shays run the new extension will provide some nice running time. The extension is many years off at this point, I still hope to move to a house with a nicer layout space with even more room. I just noticed the plan says "aisle for close access", it should say for "closet" access. That area is a 24" wide space to allow the two closets on that way to still be used, we need those to still function for household storage. That is really cool Jeff!! That trestle area is going to look great when that gets done! Especially with a shay and loaded coal train crossing it! Are you still planning on have some sort of logging/lumber industry on the layout? thanks, I don't think it will be possible to have any lumber stuff, maybe I can stage a train somewhere but it seems like it would be better to concentrate on make the coal part the best it can be, if I try to include lumber stuff then I will have to downsize the coal operations. If I get more space some day I would like to have some lumber operations. I really like the flowing curves than could be on offer in the future layout space. Plenty of really nice scenic opportunities opening up if that space becomes available. I redesigned the corner of the future extension to include two more small mines and a spur for the loading of logs. The road that comes from the backdrop will ford the small stream to reach the loading area. Logging won't be a main feature on my layout, most logging at my layouts time will have been done and this spur will be enough for the every now and than load of logs, it will also be a place to unload mine supplies. The real Manns Creek had many small mine openings that loaded a couple cars here and there, the mines I show will be just like those. Some of these openings only lasted a couple years, some a couple decades. I like this expanded plan very much. It would be an interesting operation without the bridge across the entry or section across the entrance to the utility room. You would not necessarily need the extension of the tipple track into the utility room, but that is the lead for a hidden staging yard, isn't it? 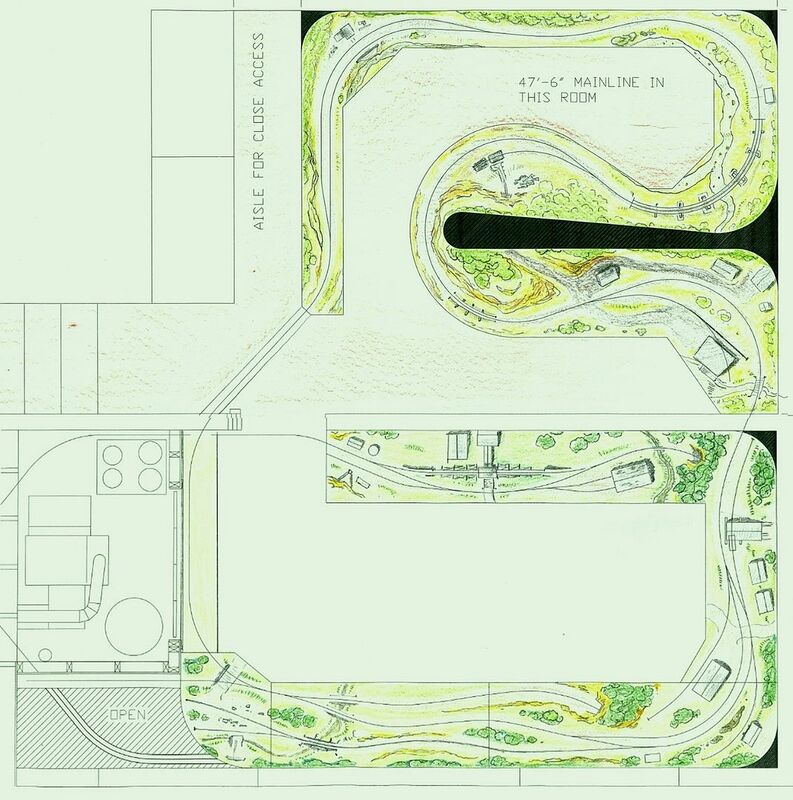 Could possibly be the "lumber transfer" track down to the unmodeled junction of the standard and narrow gauge tracks. Lumber trains might enter the layout at the aisle bridge or utility room door section and run through to the staging yard. 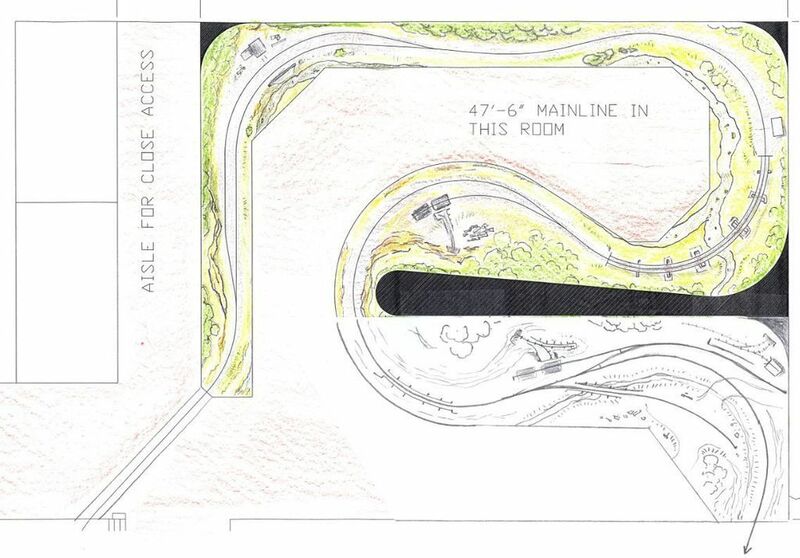 The redesigned corner with the switchback siding ... may be cool if the foreground spur climbed a steep grade. If you could figure out how to hold empties on that spur, back the locomotive out of the way, then cut the cars on the steep spur loose to roll back out onto the main, it could be a very convenient little feature for the crews. Really liking the new track plan. Lots of running with smooth curves and plenty of switching opportunities. Just one question, do the two tracks leading of the plan on the lower left lead to another future expansion, do they lead to staging or do they just end there? I would not need to have the original lift bridge to operate, not even to use the hidden staging yard because there is a switch to hidden staging just under the company store, you can see it back on page one or two of this post. Very nice, I like the 2nd version best. Question.. in the complete diagram, lower left in the "open" area.. is that a staging track that goes under the table? As far as I can tell it just disappears.